Windows Communication Foundation (Code named Indigo) is a programming platform and runtime system for building, configuring and deploying network-distributed services. It is the latest service oriented technology; Interoperability is the fundamental characteristics of WCF. It is unified programming model provided in .Net Framework 3.0. WCF is a combined features of Web Service, Remoting, MSMQ and COM+. 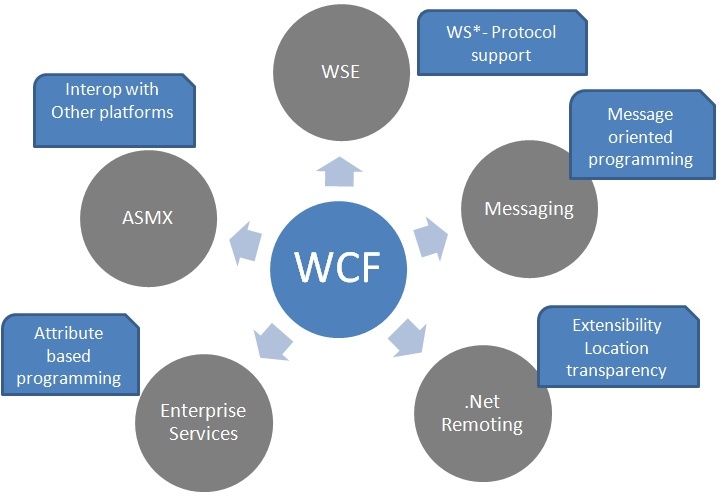 WCF provides a common platform for all .NET communication. Below figures shows the different technology combined to form WCF. Making right design for your requirement is little bit difficult.